If I were forced to rank herbs by order of preference (what kind of a weirdo survey is this!?) mint would probably be second. Cilantro is first, of course, and then mint, which I have been putting in everything lately. A few weeks ago, I hosted a Sunday brunch for my parents and in-laws. It was a hot day, and I wanted to keep the meal light, so I served a variety of light Spring-like things: a whole baked herbed salmon, roasted vegetables, whipped feta, an overflowing cheese plate, etc. 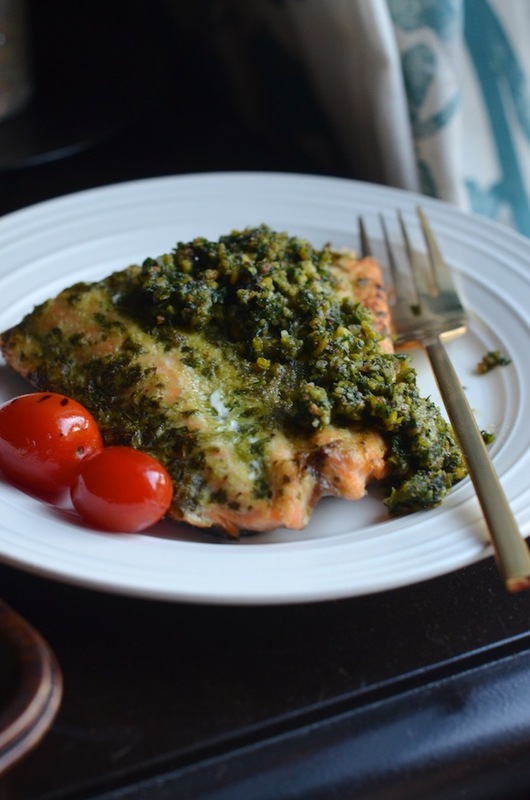 Along with the salmon, I made a Pistachio Mint Pesto that ended up being one of the biggest hits of the meal. 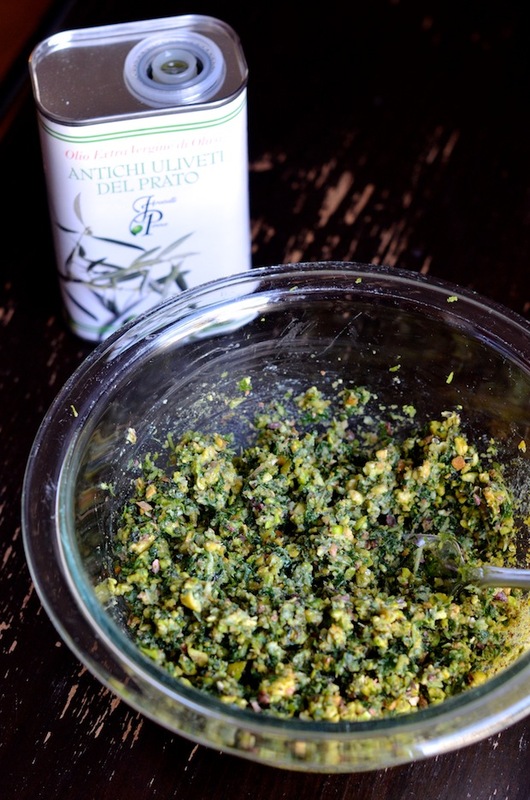 If you've never really branched out beyond the classic Italian basil-pine nut pesto, I really urge you to play around. The recipe is so flexible--you just need some kind of herbs (or even a mix! ), some kind of nut, some garlic, some oil, and a few seasonings. You can add cheese, too, but I preferred to keep this particular one dairy-free and then serving crumbled feta on the side. Mint and pistachio are a natural pairing in Middle Eastern dishes, and since that's the feel I was going for, it worked out beautifully. Because I've been rebelliously adding fresh lime to everything despite the cost, I also included it in this recipe, and loved the brightness it added. A big batch of this will keep well in a sealed container in the fridge for about a week. Eugene and I enjoyed the leftovers along with grilled shrimp and chicken, and on top of scrambled eggs. It's one of those handy little sauces that makes summer eating so incredibly easy and satisfying. This makes a chunky pesto, if you like something creamier, increase the oil and puree until smooth. 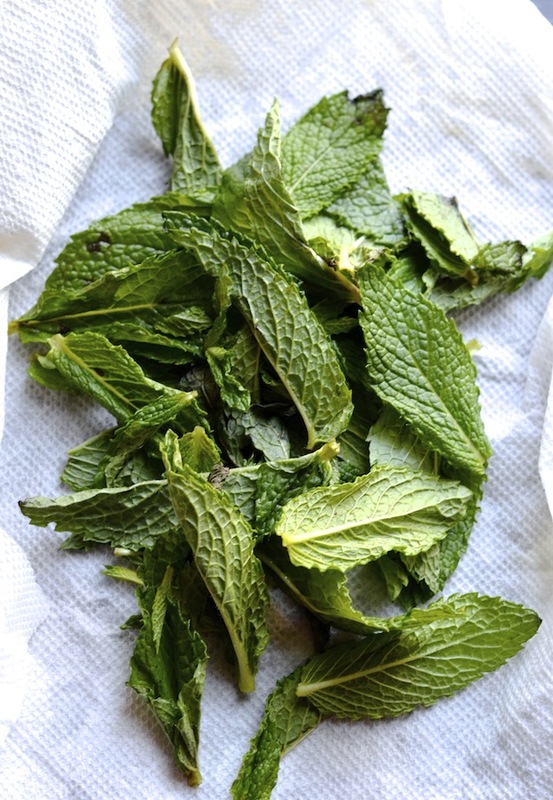 Use a knife to finely chop mint, then place in a small bowl. Combine pistachios, garlic, salt, and lime juice, and place in food processor. Pulse until coursely chopped. Combine with mint and stir to evenly distribute. Stir in olive oil. Taste and adjust salt, if necessary.